This morning, the wind was calm and even clear sky could be seen from between clouds. 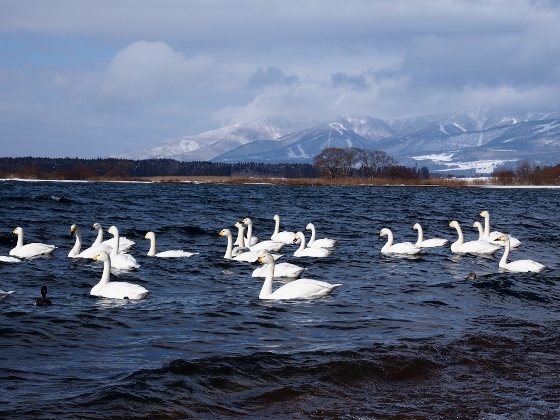 That was why I decided to visit Shidahama Beach of Lake Inawashiro again. 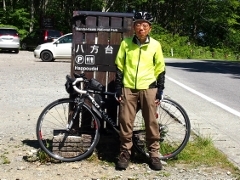 The owner of the Kohan Guesthouse Inn kindly drove me there. When leaving there I walked to JR Sekido Station which was about 30 minutes' walk and the snow had been removed, and then took a train of Ban-etsu West Line to Koriyama. 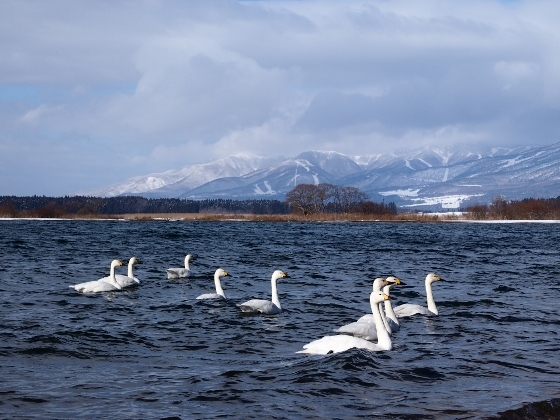 Today at Shidahama, since the weather was pleasant, swans were in and out of the lake, thus I could see different view from yesterday. Those scenes were shown below. 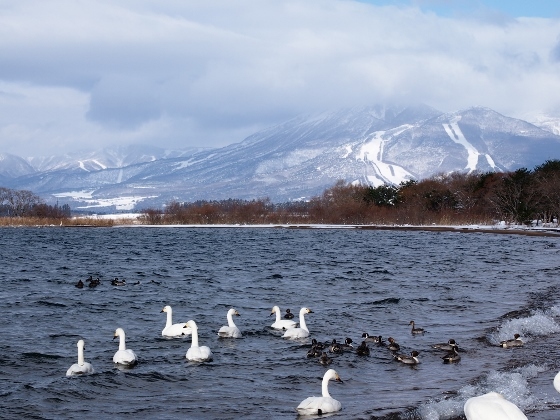 Above pictures show swans swimming in the Lake Inawashiro with Mt. Bandaisan in the background. After 10 minutes' swimming in the lake they moved to the beach for rest and this was repeated. Above picture shows the view after the swans entering the lake. Swans were moving towards the beach. 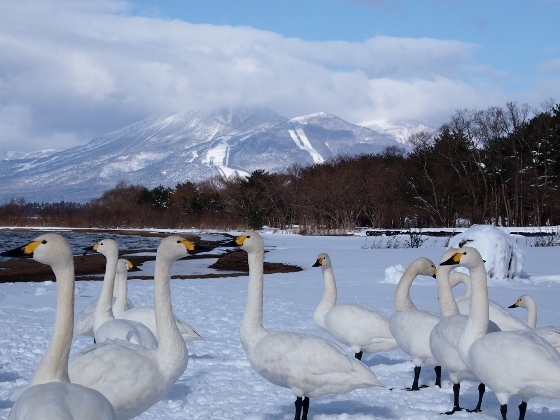 Swans were taking a rest on the snow beach. 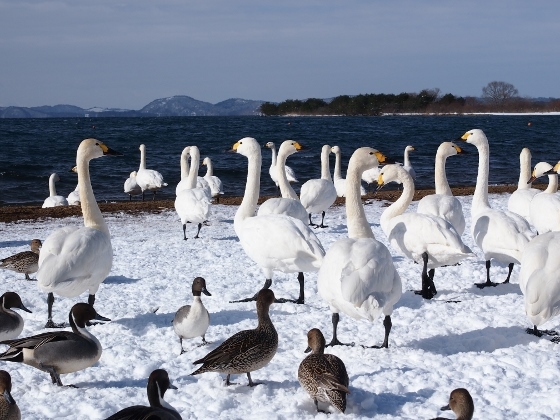 There were more than 50 swans here at Shidahama. 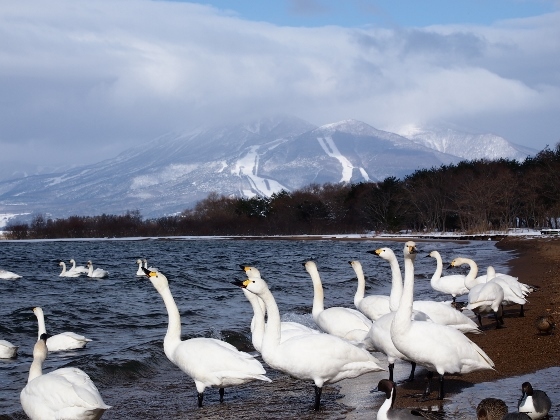 I heard from a local man that they flew to several other beaches of Lake Inawashiro such as Nagahama which was a northern beach, and the total number would count as much as about 200.